Regardless, my understanding is that the Tarot came AFTER the playing cards… but who knows… someone? They correspond directly to the Hebrew Alphabet/Aleph-Beth. They correspond directly to different mental states/levels of consciousness/types / archtypes. arc/angle/angel types??? They seem, in my opinion, to be cyclical… We become the fool again, in order to obtain the world/universe (be light-bulb-ed/ah-ha-ed), to right quickly find ourselves again the fool. Note: it’s the fool that speaks first… and I admit that as me with this site even, and desire to be again and again and again until I’m as close to God/Spirit/All as I can obtain in this manifestation of … the neoelph. 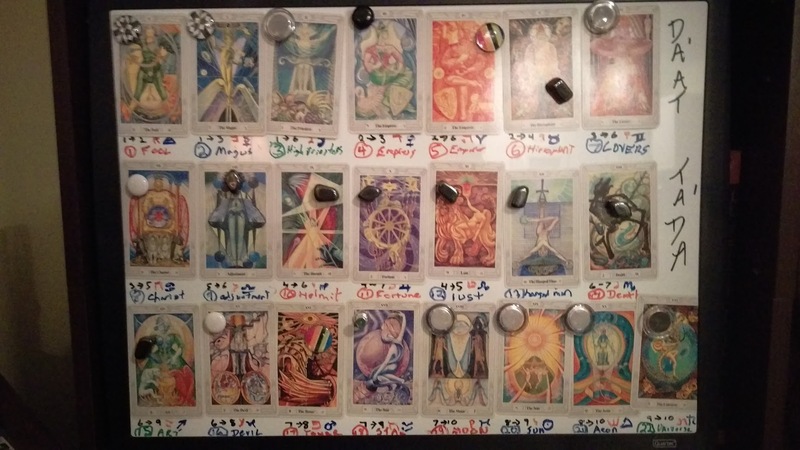 There are the major arcana (as I’ve been discussing, which relate to the archtypes). and of course so many other correspondences… and idk if i’m even ready to being to discuss the paths on the tree of life and the tarot’s relation, much less the Hebrew alephbeth’s relations. know that you can find tarot cards now of every flavor: robots, your fav characters from whatever mov or video game, disney (sindye? you coloring sin or telling ppl to sin and die…? damn walt… or is your 1st name/mane more like law(T|sade)Cross)? For all I know, you’re intent is/was good/positive, but I don’t see it… show me how perhaps? This entry was posted in tarot and tagged correspondence, divination, mentalism, scrying, symbology, tarot, tree of life by Z30 AJF. Bookmark the permalink.